I love my local library! I like going online and placing books,videos and cd's on hold and then going to pick them up and I not having to worry about money unless I am late in returning the item. But I don't return them late because my library sends me an email notification 2-3 days before the item is due and I can renew or remind myself to take it back. I love my local library! Today have a new love, it is still the library but in mobile form. The bookmobile saves me even more money, if that is at all possible. Now I don't even have to spend the gas to get to the library and try to find a place to park. My library has been getting very busy in this economy and it has made it hard to find a parking place that isn't a block away. My library bookmobile brings the books, movies and cds to me. I walk over, a 10 minute walk, and give them my library card and walk back home. My bookmobile also stocks one copy of whatever the latest movie is for the week so I don't have to be the 342nd person in queue. I could have checked out Twilight today, instead I went for Quantum of Solace. My library bookmobile also comes on the same day each week, Wednesday, and sits and waits for me until 8pm. An added bonus, the librarians in the my bookmobile are the nicest people around, they know everything about anything library related. I love my bookmobile! I love my library; I thought you should know. 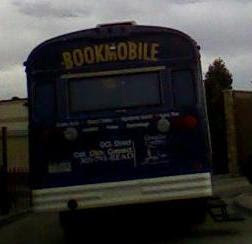 UPDATE: In August of 2009, they had to cut the bookmobile service due to budget cuts. Man, I would have voted for my taxes to go up to keep it too! Oh man! I used to love the Bookmobile when I was a kid in Oregon. Right now we are living overseas so we have no such thing, but there is a nice little English library for our daughter, which leads us to visit frequently. If they would add a bookmobile, they would have insurance of even more usage, I bet... but it's probably not in the cards here in SE Europe. I know I will eventually see it, I like vampire movies, but was in the mood for something else at the time. The only downside is that with more than 4 people browsing, it gets crowded.